Taizhou Jiajia Trading Co., Ltd.
Ningbo own Lishe International Airport and modern sea port. At the same time,they will take photos and shoot video for you. 2) Send us your samples, and we will make it according to your quality. Ningbo Luckytime Imp & Exp Co., Ltd.
2. Clear plastic allows for easy identification of contents without opening the box. 4. When used, can stack up neatly for easy storage. Please contact us immediately when you get defective, thanks. Specifications Plastic window cleaner / water scraper 1) Material: 2) Packing:Export Packaging 3) Usage: for garden or agriculture. Company Introduction Lianqi mould and plastic factory specializes in producing recyclable and convenient plastic packing. Product Details This kind of plastic window cleaner / water scraper is made from environmental plastic, we are the factory, we have very nice price. Item NO. 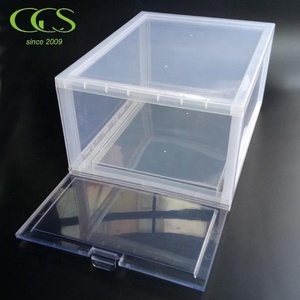 Acrylic Clear acrylic shoe display drop front shoe box specifications item Clear acrylic Transparent 3mm acrylic shoe box with lid material acrylic product features 1.simple structure, direct viewing, special polishing design for your product exibition. 2.great weaterable and excellent chemical resistance 3.excellent overall performance 4.easy clean, not easy to damage our advantages 1.Size: we make it according to your size requirements 2.Material:acrylic 3.Logo: silk-screening or engraving 4.Color:different color 5.Your special design is welcomed 6.professional workteam 7.We supplying the best service. 8.Garantee the product quality Delivery& Payment 1.packag:polybag, inner box and export carton or as your requirment 2.Sample time: 7 working days 3.Order leadtime: 10-30 working days,depend on quantity 4.Payment:T/T,Western union. Jieyang Pasdar Hardware & Plastic Co., Ltd.
Alibaba.com offers 1,600 drop front shoe box products. About 36% of these are packaging boxes, 31% are storage boxes & bins, and 27% are display racks. A wide variety of drop front shoe box options are available to you, such as plastic, acrylic, and pmma. You can also choose from clothing, sundries. As well as from eco-friendly, stocked, and folding. And whether drop front shoe box is red, ivory, or pink. There are 1,615 drop front shoe box suppliers, mainly located in Asia. The top supplying countries are China (Mainland), Hong Kong, and Canada, which supply 97%, 1%, and 1% of drop front shoe box respectively. Drop front shoe box products are most popular in North America, Western Europe, and Eastern Europe. You can ensure product safety by selecting from certified suppliers, including 335 with ISO9001, 245 with Other, and 97 with BSCI certification.